Mustard Seed Missions: Who is Grenn Moutad? Grenn Moutad, is a group of five Haitians who organize the medical clinics for us. One of them, Witchner, is a university student who is a true leader; he’s applying to study theology in the US. He and Amoce, a 27 year old man who does not yet go to university, are our wonderful translators. Marcia and Rivenson Dige are the local pastor and his wife. A young couple in their late 20’s with three great little kids. Prycille is a friend of Marcia’s who comes along to help. Marcia is a top-notch nurse, a very special part of the team. The name “Grenn Moutad” means Mustard Seed in kreyol, although it’s not commonly understood here. We (the US medical team) are quite excited by them because they have taken on ownership of providing health clinics to their own people. They approached us with the idea when we were here back in June. Then in August they returned to the places where we had done medical clinics and provided some health education. This is the first time that we have had Haitians come to us with such an idea and we’re as excited as they are. Marcia is interested in doing prenatal clinics so we have had discussions about how to do that. I think it’s a wonderful project and Mustard Seed will take that on as one of its first missions. We talked to them quite seriously about being accountable, telling them the story of our past experiences in Haiti. We said we would partner with them, but not to look for us for lots of financial support; instead we’ll help them figure out how to make it on their own. We hope to shepherd them into becoming a successful mission in their own country. The provost here at AUC suggested that one of them go through the Accounting Certificate program (4 courses) so that they learn how to manage money accurately. We thought that was a good idea and Mustard Seed will pay the tuition ($60 a course) to allow that to happen. We think this money will be a good investment. All of us are excited. 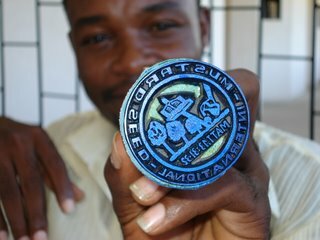 In fact, they are so excited that they had a rubber seal (stamp) made as a surprise for us. Paul and I plan to show it off at the November missions conference at College Church.